Here at the the Chattanooga Community Kitchen, we serve over 180,000 meals per year, serving three meals every day to hundreds of people. If you have any of these items sitting unused in your pantry or if you are going to the grocery store this week, please consider donating one of these items! Please bring donations to 727 E. 11st Street - drop off under the green awning. Thank you for your support! Last week at the Chattanooga Community Kitchen, Dr. Liz Boggan generously donated her time and resources to treat the pets of our homeless clients. 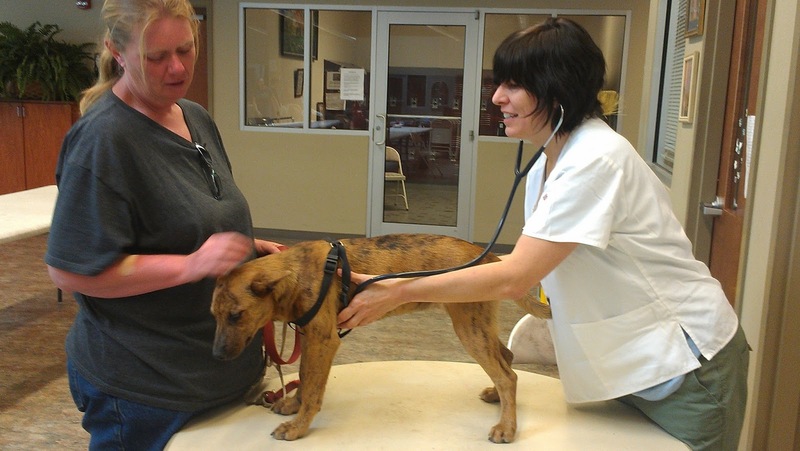 Each of the dogs and cats were updated on their vaccinations, de-wormed and examined for health problems, as well as scheduled for spay and neuter at the owner’s request at McKamey Animal Center free of charge. We want to thank her so much for coming out! There are an estimated 3.5 million individuals who experience homelessness every year in the US, but that number is dwarfed by the number of pets who are homeless. While it is difficult to actually estimate how many strays are out there, 5 – 7 million animals enter shelters every year, indicating that the homeless pet population must be much larger. Around 65% of the animals who enter shelters are euthanized: 3 – 4 million pets are put down every year. Pets can provide companionship and support sometimes beyond what humans can give each other! Given that homelessness can often be a lonely and isolating experience, it is no wonder that those experiencing homelessness would want to have a pet. In fact, the Executive Director of the National Alliance to End Homelessness estimates that 5% - 10% of homeless individuals have pets, with those numbers reaching up to 25% in rural areas. However, it is imperative for the sake of the owner and the pet for each individual to approach the experience responsibly. Many homeless shelters will not allow individuals to bring in an animal and owning a pet could also be a barrier to housing. More than that, properly caring for a pet can be a significant financial burden, including not just food and shelter, but also medical expenses to ensure the animal’s health. We are constantly working to end the condition of homelessness in Chattanooga and always innovating new ways to get our clients back into a job, back into financial stability, and back in permanent housing! We are all about the solutions that are not just a band-aid on the problem, but a long-term fix. For pets, part of the solution to end the terrible overpopulation problem is to spay and neuter both strays and our pets. Both people and pets need stability and the resources for necessary care. At the Community Kitchen, we encourage our clients to put off pet ownership until they can get back into steady housing and have the means and the comfort to care for another. For more information or resources on low-cost or free spay and neuter programs for pets or feral animals, visit McKamey Animal Center or Wally's Friends. Both programs also offer low-cost vaccinations. Be sure to visit the Kitchen's facebook page to learn more about our daily activities. Chattanooga may just be the biggest small town in Tennessee. If you grew up in this area, you know that you can’t go anywhere without seeing someone you went to school with, attended church with or worked with at some point. Recently, one of our case managers unexpectedly ran into an old friend from high school. They shared stories, laughed at childhood memories and caught up on life…like friends do. Then, they had to get down to business. The case manager’s friend had come by for a reason – he was homeless and had come to the Kitchen to receive services. As the case manager shared this story, a silence fell over our break room. You could tell the case manger was contemplating what had just happened. The job is difficult enough just being faced with the needs of so many daily; when it is someone you know personally, the reality of your job really hits home. The case manger told us it was good to see his friend. He enjoyed reminiscing about the ‘good old days’ but was shocked by the present. But, he was also glad to be able to offer a helping hand and a caring heart…after all, that’s what friends are for! In our last newsletter, we discussed our recycling program extensively. Apparently the discussion was overdue. We had a flood of calls. One came from a local church that had decided to take recycling on as a group to help the environment while supporting the Kitchen. The church was inspired by a member named Wally who had met and befriended a homeless man named Alonzo in January of 2010. Wally owns a business in Chattanooga and met Alonzo one day behind his store. Alonzo was cold and a little suspicious. But, over time, Alonzo began to trust Wally. Wally would bring him gloves, food and try to help meet some of his needs every day. After a little while, the other businesses around also began to care for Alonzo. Wally knew he had made great progress when Alonzo actually accepted a ride from him one day. Wally presented his pastor with some ways to get involved in the homeless community and at that point, the church decided to name their homeless ministry The Alonzo Project. Since then, the church has donated stuffed backpacks with much needed supplies for clients at the Kitchen. They are also beginning the recycling project. All of this from one person with a heart for someone in need and one homeless man willing to trust…we aren’t sure where Alonzo is today; but, for Wally, Alonzo will always be close to his heart.